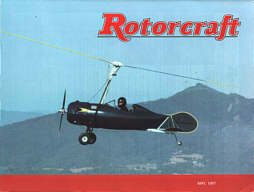 the May, 1997 issue of Rotorcraft magazine. Since October, 1996, an ad has been running in Rotorcraft for smooth extruded rotorblades with no seams, rivets or skin wrap. 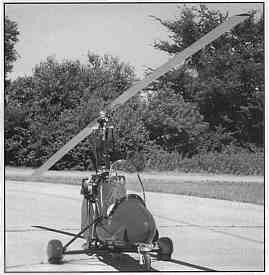 This article will share with you my making up and test flying a set on our gyroplane. Who did the extruded blade design? Mr. Fleck is the name of the man who created the design and technology of this new extruded rotor blade. 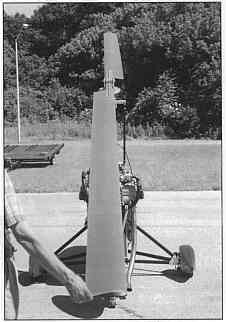 They had extrusion dies made of the 0012 airfoil for helicopter rotors and the 8-H-12 airfoil for autorotating gyroplane rotors with chord widths up to eight inches. Smaller-chord widths are also available for tail rotor blades for helicopters. A newly-formed company, Vortech International, purchased the design technology, manufacturing and marketing rights from the blades creator. end caps are molded plastic inserts. As you can see from the photos, the inner support has a beefy non-crushable area at the quarter-chord area, and three additional beefed-up airfoil supports that make the blade the most sturdy, stiff and straight blade imaginable. Remember, the blade is all one extruded member except for the full-length slip-in extruded bar/spar/noseweight, the full length of the blade inside the leading edge. This bar serves two purposes: 1) a redundant independent member spar thats a light press slip fit thats liquid epoxy applied as its inserted in the leading-edge opening of the blade; 2) the bar/spar weight is the quarter-chord noseweight. The blade material is 6063-T6 aluminum. 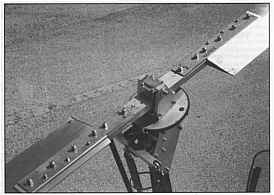 The bar/spar/noseweight is 6061-T6 aluminum, as is the top filler plate that levels the top rounded airfoil to the flat area. I've been mesmerized with rotors since building my first wood rotor in the early years, way back. I've been very blessed (or unblessed) with flying every make gyro rotor ever made. I've torn up eight sets that I can remember, and probably have worked on and gotten flying smooth more rotors than anybody except my mentor and late good friend, Bill Parsons, or maybe Ernie Boyette. I knew what I wanted in a rotor: 1) Hand startable, 2) Good lift on marginal power, 3) A strong rotor that has redundancy, 4) no droop and will stay in track perfectly and permanently, 5) A stately look, 6) Smooth, less drag, easy to care for, 7) Economical price. After over 100 hours flying my extruded rotor on a single-place, a two-place tandem, and now on a two-place side-by-side, the rotor has met my goals and accomplished all seven items mentioned above. It has made me enthusiastic enough to put forth the effort to share my success. From experience, I knew I wanted to: 1) build a hub bar with a one-degree positive blade pitch, and 2) have a two-degree upward coning angle. These degrees were milled into the hub bar to eliminate the adjusting blocks and bolts that add expense and weight. This done, I had my wife, Bernadine, help me paint on the thinned epoxy while I slid in the bar/spar, then epoxied on the top filler-leveler plate exactly over the quarter chord. I made four blade straps from 4130 steel .125 thick, 21½ wide by 17½ long. This gave 12½ on the blade and 5" on the hub bar. I used four-inch bolts in the blades and two-inch bolts in the hub bar. I put three 3/16 bolts through the straps, the blade and the bar/spar for retention (See photos). Building one set without jigs is time consuming, including layout and rechecking everything for accuracy before drilling holes in the blades and straps. 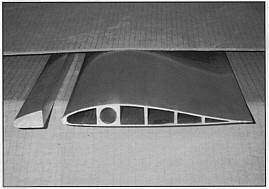 This part is very critical and blades will never fly smooth if the alignment and workmanship are not perfect. The blades must be in perfectly accurate chordwise position and perfectly accurate string alignment, and all this propped up to the coning angle, to transfer the permanent holes. Its easier to write about it than do it! place. The quarter chord is at the round beefy area. All the fine-ness and fussing and rechecking it did me good. After bolting it all up and checking the string alignment, it was perfect. Static balancing was the next step. I had to add a short 3/16 pan head with four small washers to the tip of the light blade. Next I installed molded plastic root and tip end caps. The have tabs that insert into the blades. A small drilled hole and pins epoxied in hold the caps. Here are the complete blades with hub bar straps and bolts in position. 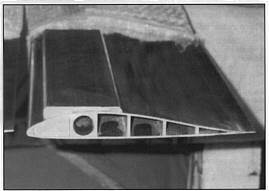 Note the filler plate under the top strap to level the airfoil curve. Three smaller bolts go through the bar/spar as retention insurance. The black plastic end inserts fit perfectly. If there is a shortcoming to this new rotor, it will be the do-it-yourself hub bar and strap building. Not everybody has the know-how to accurately do this and end up with a good-flying smooth rotor. But anyone who has good work habits, a good drill press, is not in a hurry, understands chord balance, spanwise balance, positive pitch, coning angle and tracking, can do the job if he wants to bad enough. Get a machine shop to mill the hub bar and make a teeter block. The length of my extruded rotor with 12-foot blades and a 20-inch hub bar totaled 25 feet 8 inches. Weight 72 lbs. 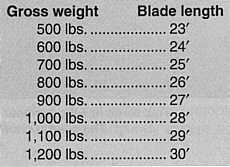 The weight is equal to the same length of other popular rotors. The extruded rotor can easily be cut to any length you want. I put the rotor on a single-place first and rolled it outside. A gentle breeze was blowing. I hand started the rotors real easy-like. They gained rpm real nice with no effort. Thats the reason I choose one degree positive pitch. I stopped the rotor, checked the gyro over, started the engine and gently armed the rotor a little, got in and taxied out. The rpm picked up quickly. Tracking looked good at about 200 rpm, so I went on out on the runway. I lifted off real easily. I liked what I felt, the track was within ¼ so l took her on up and stayed up 45 minutes. No surprises. There was very good lift and they were very responsive. To me it seemed like they turned faster, but I had no tach. The next morning I transferred the new extruded rotor to my two-place. I took off and never landed for over two hours. It was flawless, the smoothest great lifting rotor I had ever flown. This machine had a rotor tach and rotor rpms were a fast 395 to 400. Since that testing stage, eight months have passed. Mentone, Shelbyville, Mountain City, hundreds of flights and training hours have proven this new rotor has it all, strength, great lift, redundancy ease of maintenance, hand startable, and a low price. The blades are being sold by Ben Showers Aero, authorized distributor for Vortech International. See their ad in Rotorcraft. The extruded blades are straight and stiff. No droop gives an impressive strong look. They stay in track. If you don't have the roll adjustment for track like on SkyWheels or Rotor Hawk, the easy way to adjust track on a fixed hub block is to shim one side or the other under the block. If its out of track about one inch it will need about .020 shim. If it's ¼ out, about .005, etc. This is the trial-and-error method, so keep a record until you get it right. I have never met a rotor that could not be made to fly smoothly, unless it was really so far off with bad layout and workmanship. If you have the patience and are willing to adjust, then fly, adjust and fly, sometimes a whole weekend. No kidding, ask Bernadine! My formula for weight and length of a rotor is really easy. For good performance even on 90-degree days. A shorter rotor that lifts well will work, but if you like to float on landing and touch your wheels feather soft, stick to the formula [below]. Keep your blades clean of dust and bugs and they will lift their best.